R&S®INTRA provides granular and multi-faceted visibility of the network with real-time reporting. This includes statistics about protocol and application split, detailed mobile network usage data, communication quality KPIs and data rate analytics. It enables communication service providers to turn data about network usage into meaningful business intelligence and feeds for big data. R&S®INTRA features short deployment times along with flexible options to customize the solution. Integration with third party systems such as CRMs or big data systems allows building tailored reports that fit best the customer needs. Benefit from quick time-to-market for new business cases and short response times for customizations and fixes thanks to in-house development and an open reporting API. R&S®INTRA provides granular visibility of the entire network: both time-wise and segment-wise. This includes data like a reporting resolution of 1 second for each communication on the network. 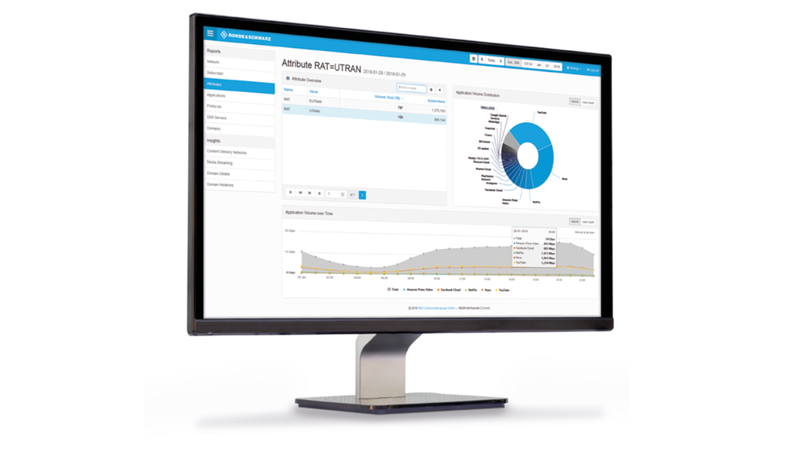 Due to control plane analysis, R&S®INTRA offers information about the traffic per radio access technology, cell and area which allows extensive analytics for customer care, network planning and operations. As customer needs differ, R&S®INTRA offers several deployment scenarios: full stack analytics and reporting platform and/or a source of data about network and subscriber behavior for export into third-party processing systems. Providing data in a flexible granularity: as fine grained as 1 second reporting interval per each communication, or aggregated to the needed degree, it fits a wide range of use cases and setups. R&S®INTRA performs real time correlation of user plane and data plane traffic for GTPv1, GTPv1 and Radius. For customer care and service optimization, this allows associating data rates and quality of experience parameters to individual subscribers, and thus faster problem identification and quality of experience improvements for subscribers. For more information how R&S®INTRA can help you in your business case, go through our solution guide or read our case studies. Rohde & Schwarz presents R&S®INTRA at Mobile World Congress 2018. Rohde & Schwarz and Radisys showcase their joint solution for communication service providers.